Come and take a peek, because inside this box and you'll find your brand new Letter Board. While there are many letter boards that look the same, this one here is unique to you. Because inside is an entire kit brimming with the potential to be anything you want to be! 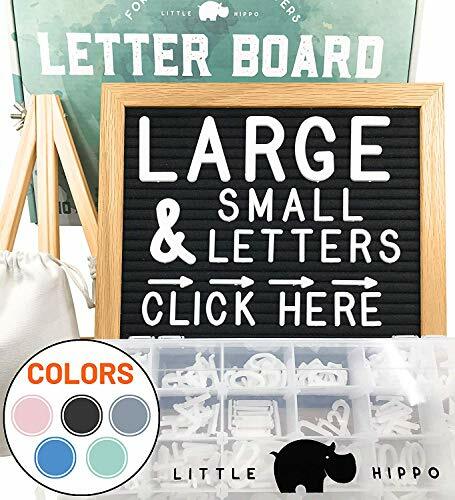 It's the Little Hippo Big 'n' Small Letterboard Kit - our newest kit featuring: 690 Characters, Big and Small Letters, Pre-Cut Letters, Organizer Container and More! #youcanquotemeonthat! NOW WITH MULTI-SIZED LETTERS! Letterboards are for creativity, so while other letter boards restrict you on accessories, the popular Little Hippo Letterboard gives you MORE! 690 Characters... in LARGE AND SMALL! #WAAAT? Yes, 3 SIZED LETTERS! (1, 2, and Inches)! You'll never be lost for words again and always deliver stand out quotes #likeaboss! THE GIFT GIVERS CHOICE: Your Letter Board Kit comes with an adjustable solid wood easel for display and letter scissors to tidy any plastic. Along with the FREE Sorting Tray you also get a BONUS Canvas Pouch, and as you see, all in a beautiful gift box! Elsewhere, you'd pay a small fortune for fewer goodies. But not here, and that's why we earned Amazon's Choice. CLEAN LINES, WELL-MADE: Obviously you don't want glue chunks on your frame or flimsy corners. That's why your new sign board is held together by sturdy Frame Joints and reinforced with thick, strong upholstery staples. While we're not saying to throw your words off a tall building, we can promise you it's the long-lasting quote board you were looking for. LITTLE HIPPO #LOVE: You've seen our #instaworthy small boards on social media, and now it's time for you to join the fun in your home, caf , restaurant, or office. It's risk free too, with our LIFETIME WARRANTY. So if you're ready to start sharing your voice in the cutest (... but loudest) way possible, you're ready for the Little Hippo Big 'n' Small Letterboard Kit, so order now.    NEVER AT A LOSS... More Letters than ever! 300-piece Character Set (White) lets you speak at length! Be more bold, proud, clever, or more sappy than ever. When you're done, collect all those 3/4 white words-to-be in the handy drawstring pouch for safekeeping. Go Get Lettering Now! HIGH QUALITY DESIGN - 10x10 dark gray finished wooden frame with light gray felt. High quality felt ensures that your 3/4 inch letters will stay put. Attached metal sawtooth bracket for wall mount presentation and attached hinge stand for table top display. Store plastic characters in drawstring pouches provided. 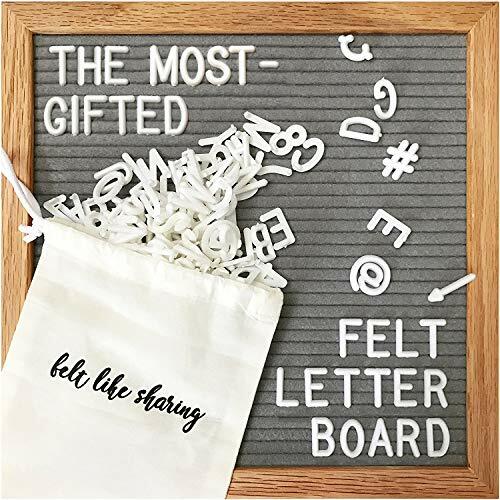 THE GIFT GIVERS CHOICE: Your chic Letter Board Kit comes with a built-in stand for display and letter scissors to tidy plastic and clip your cursive words. Along with the FREE Sorting Tray you also get a BONUS Canvas Pouch, and as you see, all in a beautiful gift box! Elsewhere, you'd pay a small fortune for fewer goodies. But not here, and that's why we earned Amazon's Choice. LITTLE HIPPO #LOVE: You've seen our #instaworthy small boards on social media, and now it's time for you to join in too! For your home, caf , restaurant or office this rustic letter board suits farmhouse d cor as equally as it does your Bohemian vibe. It's risk free too, with our LIFETIME WARRANTY. So, if you're ready to start sharing your voice in the cutest (... but loudest) way possible, you're ready for the Little Hippo Big 'n' Small Letterboard Kit, so order now. Double Sided Letter Board with everything you could dream of and more! 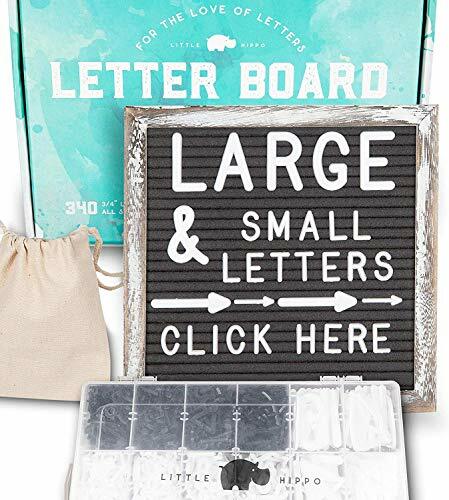 THE GIFT GIVERS CHOICE: Your Double Sided Letter Board Kit comes with a built-in stand for display and letter scissors to tidy plastic and clip your cursive words. Along with the FREE Sorting Tray you also get a BONUS Canvas Pouch, and as you see, all in a beautiful gift box! Elsewhere, you'd pay a small fortune for fewer goodies. But not here, and that's why we earned Amazon's Choice. LITTLE HIPPO #LOVE: You've seen our #instaworthy small boards on social media, and now it's time for you to join in too! For your home, caf , restaurant or office this double sided letter board suits farmhouse d cor as equally as it does your Bohemian vibe. It's risk free too, with our LIFETIME WARRANTY. So, if you're ready to start sharing your voice in the cutest (... but loudest) way possible, you're ready for the Little Hippo Big 'n' Small Letterboard Kit, so order now. Specification: Size:19x10inch/25*48cm Ultra Bright LED Open Sign. Two light modes: Flashing or Steady Power adapter:110V Standard US Plug Hanging chain included. Package including: 1XAgptek LED open sign 1x close sign 1xWarrnty card NOTE: BrainyDeal as a professional LED board manufacturer ,customer satisfaction is the purpose of our service. And We offer one year warranty and 30 days no reasons refunds. If you had meet any questions when using please contact our customer service. EYE CATCHING: AGPTEK Neon Open Signs are ultra bright and striking. Open sign board would attract lots of passerby's' attention! Outshine your competitors with this lighted board and get new and returning shoppers flocking to your business. 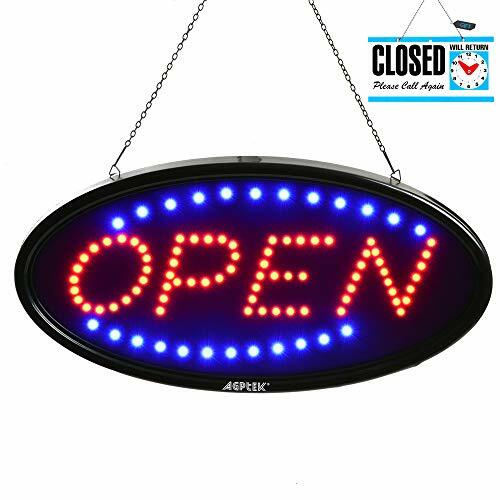 APPLICATION&WARRANTY: Lighted outdoor open sign is ideal for Glass Window, Walls, Display case, Shop, caf Bar, Bar, Hotel...What' more, we offer One Year Warranty and 30 days No Reasons Refunds. We manufacture and sell quality products and we believe that quality, safety and customer service are the core values of our business. We want to be an honest seller, and every product we sell is carefully inspected to strictly control product quality. We firmly believe that every product is our best gift to our customers. You don't have to worry about shopping at Obliviscar! END CLUTTER AND ENDLESS SEARCHING Pre cut and sort 600 letters - Imagine you need two hours to cut the letters, and in the letter pile you need ten minutes to find the letter you want. But not us! Here, you only need a few seconds to find the letter you want.#WAAAT? 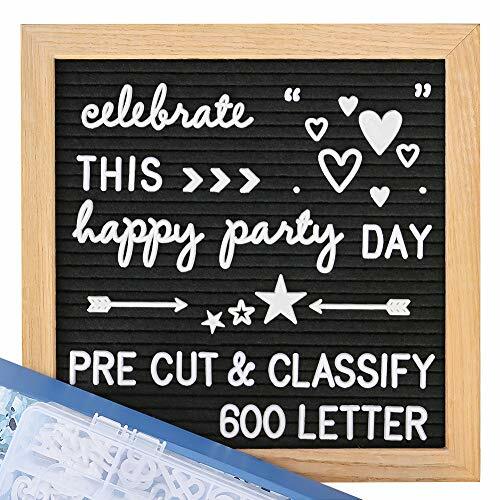 Yes, Obliviscar is the only letter board set on the market that helps you pre-cut and sort all the letters.We can promise you it's the long-lasting quote board you were looking for. EXCEPTIONAL QUALITY, HANDMADE FELT LETTER BOARDS - The Obliviscar letter board features high quality and compact felt, ensuring that the 3/4 inch letter remains the same and does not fall out of its position. Even if you flip the board 180 and tap it, the letters won't fall off! Attached metal sawtooth bracket for wall mount presentation. Eliminate all your concerns!!! PERFECT SERVICE - 100% Quality Assurance Buy with confidence when you shop at Obliviscar! if you have any questions, please contact us in time, we ensure the quality of every item personally Your satisfaction is our top priority. Enjoy the letter board to leave a beautiful mark for every special moment in your life, order now! Share your thoughts and meaningful messages in style with our double sided letter board! This unique felt letter board designed by The Orginal Letter board Supply is an authentic combination of beauty, extremely functional design, durability, and classy craftsmanship. We created a letter board kit box with EVERYTHING you need to express yourself: 2 sided (black/grey) - twice more contrast and diversity Perfect size [12x12 inches] - spacious enough Sturdy natural oak wood stand - extra longevity Premium high-end felt - high-quality fabric that compliments any space 467 alphabet letters, numbers, hashtags, and punctuation - versatile, generous lettering 2 adorable storage/travel bags to keep letter board kit accessories well-organized Both Large (2 inches big) AND Small characters - empowering more inspirational ideas or sayings. Carefully packed in a signature box. You don't need to struggle with our letters. Forget stems and wasting time cutting or breaking off letters. Enjoy the perfect simplicity of clean-cut characters. Just pick and place! 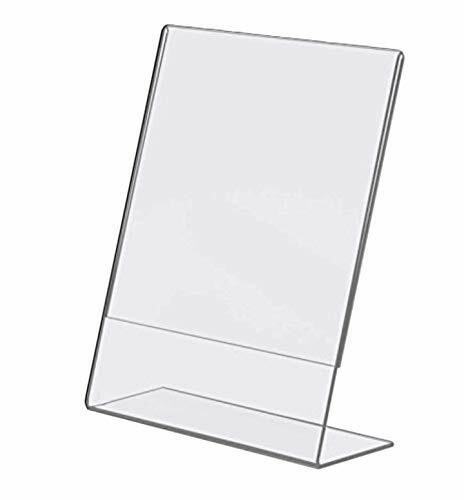 Simply take it out of the box and within seconds, your new display will charm everyone (equally fit as a standing letter board or as a hanging message board). Suitable for every retro or modern decor, kitchen or personal space, our personal letterboard designs stylishly display restaurant specials, announcements, classroom daily quote or cafe offers. Uplift your store or craft space! UPGRADED! 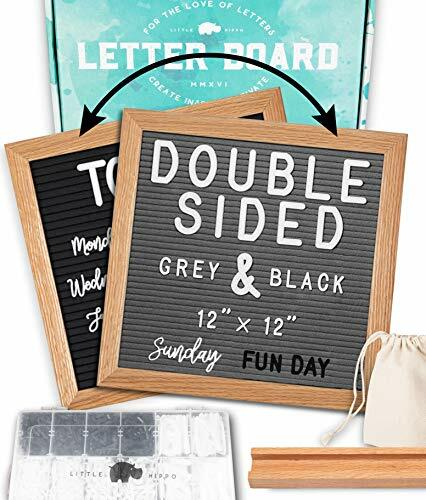 - DOUBLE SIDED GRAY/BLACK LETTER BOARD. Includes an oak solid stand or can be hung on a wall. Perfect visibility for inspiring messages, quotes, hashtags, instagram, facebook, baby announcements. Includes symbols and emojis. 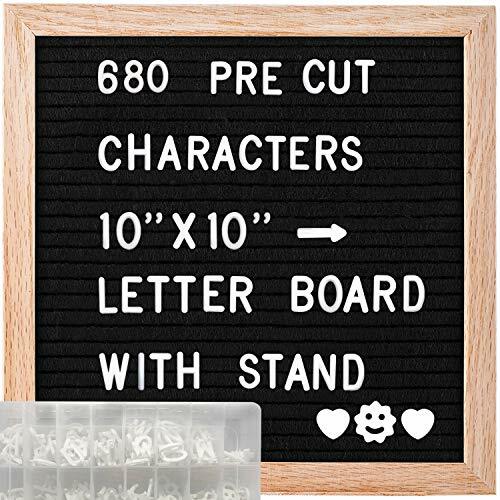 2 LETTER SIZES - LARGE AND SMALL DOUBLE CREATIVITY - this Letter Board has 467 (Wow!) pre-cut Letters & Symbols both large and small. Handy pouch to keep all your large and small letters for easy storage. Fully pre-cut so no annoying tabs or nibs to cut off. Saving you time to create messages. STRONG LONG-LASTING OAK FRAME - More resistant & durable than easel stands. Includes wall mount hanger to display your messages on the wall. Matching oak wood stand provides stability and a base for your letter board. CHARMING CHANGEABLE FELT LETTER BOARD with pre-cut white plastic letters in large and small sizes & original oak wood frame and stand. All presented neatly in a gift box. Makes a great Christmas, Graduation or Birthday gift. QUALITY CRAFTSMANSHIP - A superb touch of style to any home/office desk, bedroom, tabletop or as wall d cor. Great for instagram profile and stories. Teen bedroom Decor. Solid Letter Board. Strong and reinforced frame. 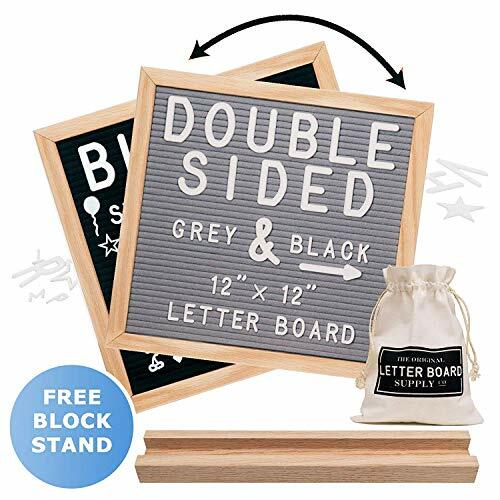 This felt letter boards come with an attached sawtooth mounted hanger on the back and flexible stand, you can hanger it on the wall or display it on a desk. You can use it to decorate in wedding, school classroom, occasion announcement, store, coffee house baby and kids milestone even the kitchen. >Say goodbye to traditional canvas bags and organize the letters in a box. No more wasting time to find the letters you need. Save your hours! We have 690 letters (include letters, symbols, and emojis ). You don't have to worry about the lack of the letters you need, and you can organize the words you want to express. YOUR BEST GIFT CHOICE-This changeable letter board is a great ideal choice to express your best wishes and blessings. A cute black handmade felt board that you will love it which has funny letters and creative design. It was perfect for Christmas, birthday, anniversary, wedding or baby shower etc. 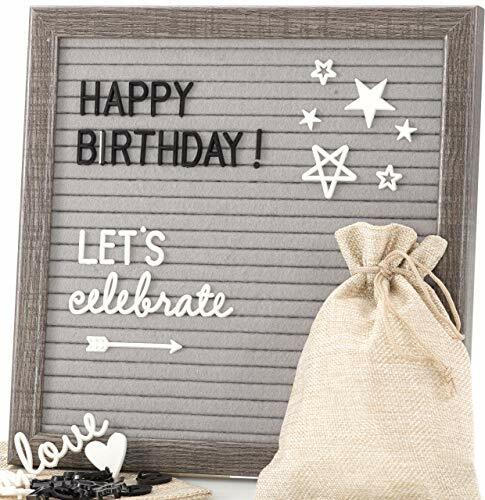 DECORATE IN ANY OCCASION-This felt letter boards come with an attached sawtooth mounted hanger on the back and flexible stand, very convenient to place everywhere you want. 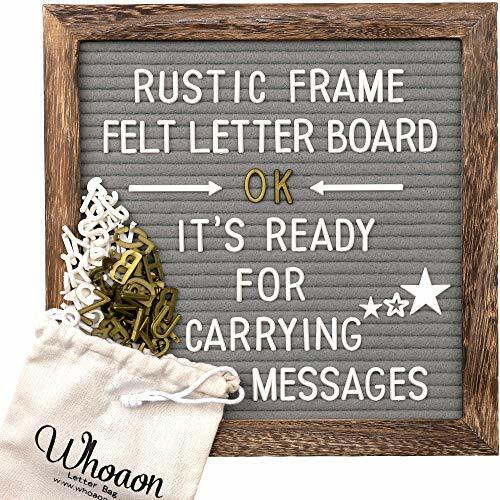 Wonderful letter board to decorate in wedding, school classroom, occasion announcement, store, coffee house, farmhouse, office, baby and kids milestone even the kitchen. 680 PRE-CUT LETTERS IN BOX- All 680 (include letters, symbols, and emojis ) were pre-cut and were organized in a box. Save your hours and easy to find the letters you want. 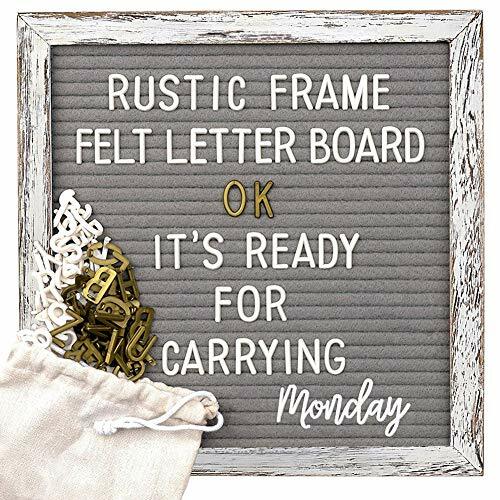 STURDY OAK WOODEN FRAME -This high-quality letter boards constructed with a sturdy natural oak wood frame, internal black durable felt is not easy to pilling and dirty. OUR PROMISE & GUARANTEE: You'll get a full 1-year warranty against any kind of defects in material and workmanship. BUY WITH CONFIDENCE If you have any questions with our letter board, please feel free to contact us. The sign is ideal for all kinds of small businesses and shops ranging from a diner, cafe or hotel to a dog grooming or liquor store to an ice cream or gelato outlet. It can even be used in a club or bar. 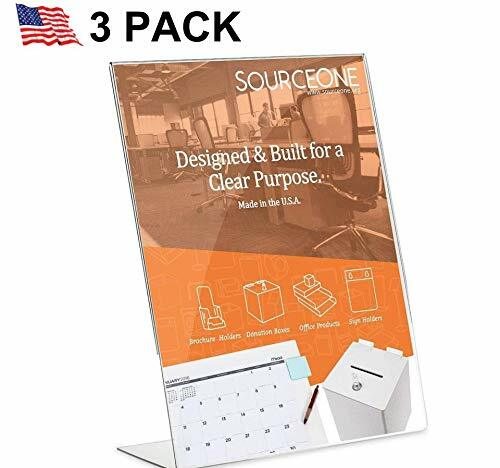 The background of the sign is red with white spaces to allow you to insert hour stickers, creating the perfect advertisement tailored for your specific times. Customers arriving at your storefront will be informed of your open hours, reducing the likelihood of them phoning or visiting your store after hours. IDEAL SIGNAGE FOR : All kinds of commercial businesses and retail offices looking to draw customers attention to their business operation times. For example, the sign is ideal for advertising the business hours of a restaurant, fast food facility, beauty salon, club, barbershop, spa, pharmacy, coffee shop, bakery, boutique, grocery store, tattoo or pizza parlour and so on. 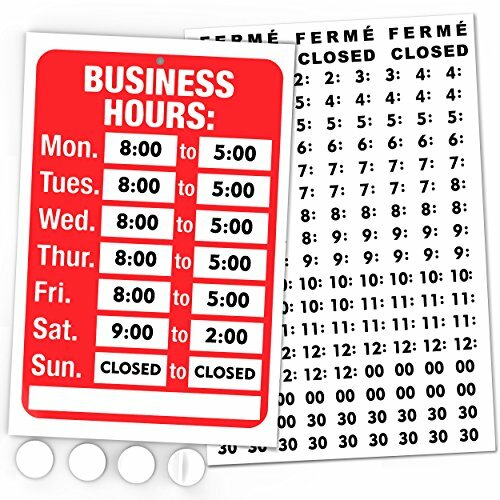 CUSTOMIZABLE NUMBERS: The sign kit contains a series of number and letter stickers so you can tailor and personalize the business hour cling to display your exact business hours in your storefront. The large sign has dimensions of 11.7 inches tall by 7.7 inches long and is made of plastic. QUICK TO ASSEMBLE: Assembly time is about 15 minutes. Carefully peel off the stickers and fill them into the white spaces in the sign, working from left to right and top to bottom one at a time. Use a ruler or something similar to ensure the numbers are aligned straight on the sign. Once all the numbers are applied use the double adhesive pads to cling the sign to the window or alternatively you can hang the sign up with a chain or twine if you have one available. EASE OF USE AND LOW MAINTENANCE: This sign can be stuck up on a glass window, door or wall where it can be clearly seen by passers-by. Once applied no more maintenance is required. This vibrant Headline sign allows you to clearly communicate to your customers if you are Open, and if not, when you Will Return. 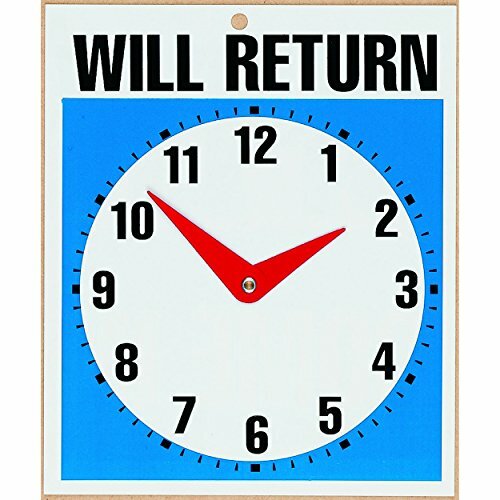 One side of this durable 7.5 inch x 9 inch plastic sign lets people know you are Open/Come In, and the other side lets people know when you Will Return. Easily indicate your return time with easy-change clock hands. An exterior sign is the first opportunity to express yourself and your corporate identity. Whether it is in the front window or in the front yard, Headline exterior signs make a great first impression! Hang this no soliciting sign on your door or wall to protect your privacy at home or at your business. 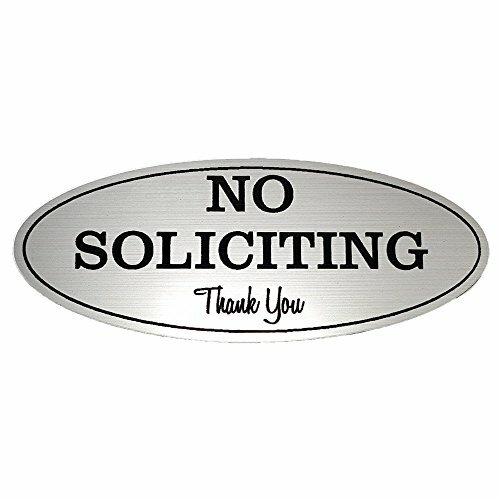 The sign features laser-engraved black letters reading, "NO SOLICITING" and "Thank You." 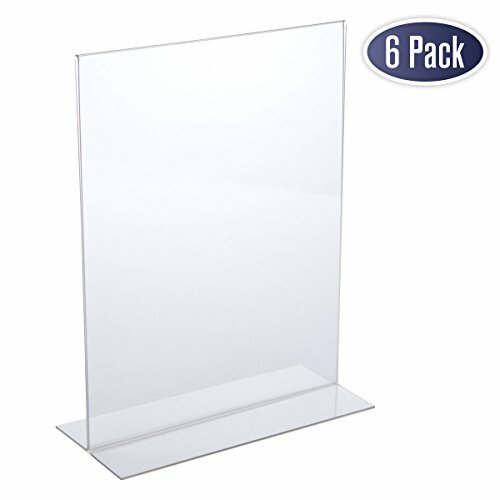 A sturdy plastic construction promises long-lasting use, while an adhesive strip on the back makes mounting a breeze. As a little reminder to yourself. WEATHERED RUSTIC LOOK: Every changeable felt letter board has a classic farmhouse rustic 10" x 10" frame.Made by pure handicraft, so every grey changeable letter board is unique in the world ( May be some variation ). REUSABLE LETTERS & DOUBLE-SIDED: 376 white & 188 gold and 188 black characters. (January - December) & (Monday - Sunday) cursive words / Additional emojis character sets are also included.Covering all daily written expressions you need. 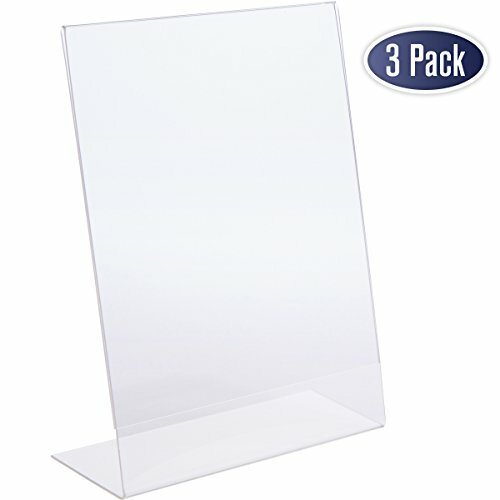 WHITE WOODEN EASEL & METAL HOOK: Elegant white easel perfectly goes with the classic felt board,designed for displaying,advertising,or tracking your notes on tables for your family or else, as well as a decoration for your home.Easy to be displayed on a shelf or cabinet thanks to the metal hook. HIGH QUALITY: Our gray letter board is a perfect substitute for those low quality designs that letters don't stay put, falls apart, are damaged upon delivery perfectly.Original weathered wood material and 100% handmade guarantee the message sign as a great gift for all special occasions! Baby shower, wedding shower, birthday, anniversary, milestone, holidays. 30 Day Money Back & 3-year warranty Guarantee your felt letter board purchase with Tukuos is completely covered. Just contact us if you have any questions or issues and we will solve your problem.